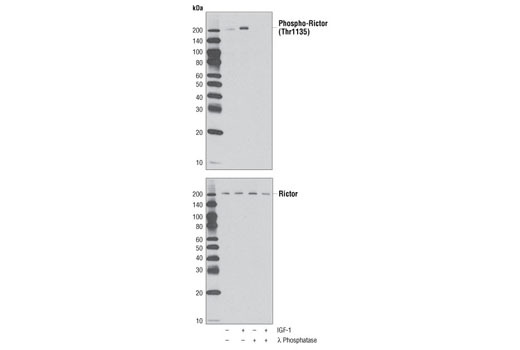 Western blot analysis of extracts from serum-starved HeLa cells, untreated or treated with IGF-1 (50 ng/ml, 30 minutes) and λ phosphatase, using Phospho-Rictor (Thr1135) (D30A3) Rabbit mAb (upper) or Rictor (53A2) Rabbit mAb #2114 (lower). Phosphorylation of Thr1135 on rictor was identified at Cell Signaling Technology (CST) using PhosphoScan®, CST's LC-MS/MS platform for phosphorylation site discovery (5). 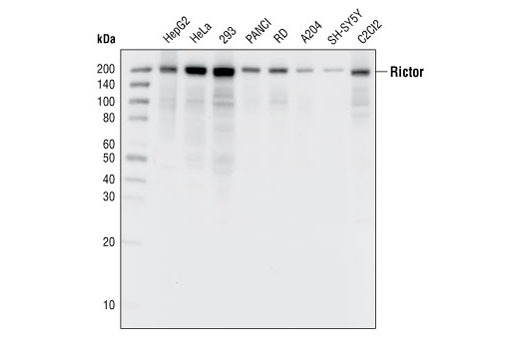 Additional research indicates that rictor is phosphorylated at Thr1135 by p70 S6K, which negatively regulates mTORC2 protein complex as part of a negative feedback mechanism controlling Akt activity (6-8). Dibble, C.C. et al. (2009) Mol Cell Biol 29, 5657-70. Julien, L.A. et al. (2010) Mol Cell Biol 30, 908-21. Treins, C. et al. (2010) Oncogene 29, 1003-16.